I'm often asked why I don't talk about neural network frameworks like Tensorflow, Caffe, or Theano. I avoided these frameworks because the main thing I wanted to do was to learn how neural networks actually work. That includes learning about the core concepts and the maths too. By creating our own neural networks code, from scratch, we can really start to understand them, and the issues that emerge when trying to apply them to real problems. We don't get that learning and experience if we only learned how to use someone else's library. But there are some good reasons for using such frameworks, after you've learned about how neural networks actually work. One reason is that you want to take advantage of the special hardware in some computers, called a GPU, to accelerate the core calculations done by a neural network. The GPU - graphics processing unit - was traditionally used to accelerate calculations to support rich and intricate graphics, but recently that same special hardware has been used to accelerate machine learning. The normal brain of a computer, the CPU, is good at doing all kinds of tasks. But if your tasks are matrix multiplications, and lots of them in parallel, for example, then a GPU can do that kind of work much faster. That's because they have lots and lots of computing cores, and very fast access to locally stored data. Nvidia has a page explaining the advantage, with a fun video too - link. But remember, GPU's are not good for general purpose work, they're just really fast at a few specific kinds of jobs. 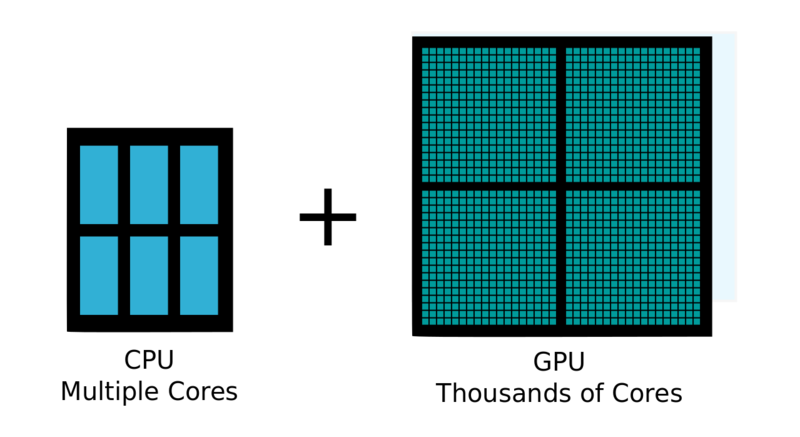 GPU's have hundreds of cores, compared to a CPU's 2, 4 or maybe 8. Writing code to directly take advantage of GPU's is not fun, currently. In fact, it is extremely complex and painful. And very very unlike the joy of easy coding with Python. This is where the neural network frameworks can help - they allows you to imagine a much simpler world - and write code in that word, which is then translated into the complex, detailed, and low-level nuts-n-bolts code that the GPUs need. There are quite a few neural network frameworks out there .. but comparing them can be confusing. There are a few good comparisons and discussions on the web like this one - link. It's largely vendor independent. Tensorflow has a lot of momentum and interest, but is very much a Google product. It's designed to be Python - not an ugly and ill-fitting Python wrap around something that really isn't Python. Debugging is also massively easier if what you're debugging is Python itself. It's simple and light - preferring simplicity in design, working naturally with things like the ubiquitous numpy arrays, and avoiding hiding too much stuff as magic, something I really don't like. Some more discussion of PyTorch can be found here - link. To use PyTorch, we have to understand how it wants to be worked with. This will be a little different to the normal Python and numpy world we're used to. build up your network architecture using the building blocks provided by PyTorch - these are things like layers of nodes and activation functions. you let PyTorch automatically work out how to back propagate the error - it can do this for any of the building blocks it provides, which is really convenient. we train the network in the normal way, and measure accuracy as usual, but pytorch provides functions for doing this. to make use of the GPU, we configure a setting to and push the neural network weight matrices to the GPU, and work on them there. We shouldn't try to replicate what we did with our pure Python (and bumpy) neural network code - we should work with PyTorch in the way it was designed to be used. A key part of this auto differentiation. Let's look at that next. A powerful and central part of PyTorch is the ability to create neural networks, chaining together different elements - like activation functions, convolutions, and error functions - and for PyTorch to work out the error gradients for the various parameters we want to improve. That's quite cool if it works! Let's look at that more slowly. 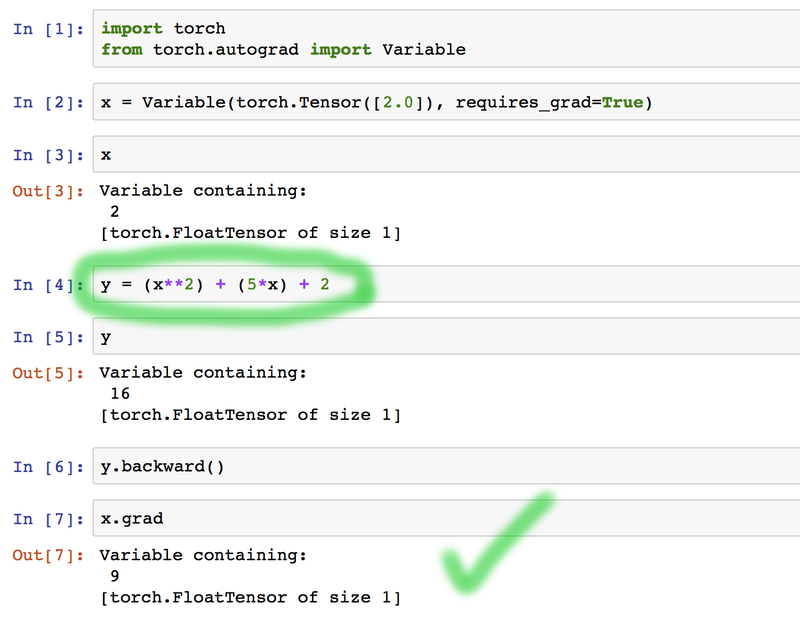 First we import torch, and also the Variable from torch.autograd, the auto differentiation library. Variable is important because we need to wrap normal Python variables with it, so that PyTorch can do the differentiation. It can't do it with normal Python variables like a = 10, or b = 5*a. Variables include links to where the variables came from - so that if one depends on another, PyTorch can do the correct differentiation. We then create x as a Variable. You can see that it is a simple tensor of trivial size, just a single number, 2.0. We also signal that it requires a gradient to be calculated. A tensor? Think of it as just a fancy name for multi-dimensional matrices. A 2-dimensional tensor is a matrix that we're all familiar with, like bumpy arrays. A 1-dimensional tensor is like a list. A 0-dimensional one is just a single number. When we create a torch.Tensor([2.0]) w'ere just creating a single number. We then create the next Variable called y. That looks like a normal Python variable by the way we've created it .. but it isn't, because it is made from x, which is a PyTorch Variable. Remember, the magic that Variable brings is that when we define y in terms of x, the definition of y remembers this, so we can do proper differentiation on it with respect to x. So let's do the differentiation! That's it. That all that is required to ask PyTorch to use what it knows about y and all the Variables it depends on to work out how to differentiate it. This is how we ask for that to be done. It works! You can also see how y is shown as type Variable, not just x. So that's cool. And that's how we define our neural network, using elements that PyTorch provides us, so it can automatically work out error gradients. Let's look at some super-simple skeleton code which is a common starting point for many, if not all, PyTorch neural networks. The neural network class is derived from torch.nn.Module which brings with it the machinery of a neural network including the training and querying functions - see here for the documentation. The nn.Linear() module is the thing that creates the relationship between one layer and another and combines the network signals in a linear way .. which is what we did in our pure Python code. Because this is PyTorch, that nn.Linear() creates a parameter that can be adjusted .. the link weights that we're familiar with. You can read more nn.Linear() about it here. We also create the activation function we want to use, in this case the logistic sigmoid function. Note, we're using the one provided by torch.nn, not making our own. Note that we're not using these PyTorch elements yet, we're just defining them because we have the information about the number of input, hidden and output nodes. We have to over-ride the forward() function in our neural network class. Remember, that backward() is provided automatically, but can only work if PyTorch knows how we've designed our neural network - how many layers, what those layers are doing with activation functions, what the error function is, etc. So let's create a simple forward() function which is the description of the network architecture. Our example will be really simple, just like the one we created with pure Python to learn the MNIST dataset. You can see the first thing we do is convert the list of numbers, a Python list, into a PyTorch Variable. 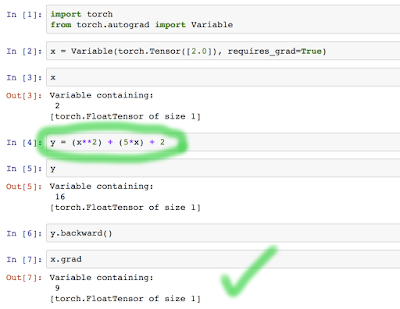 We must do this, otherwise PyTorch won't be able to calculate the error gradient later. The next section is very familiar, the combination of signals at each node, in each layer, followed immediately by the activation function. Here we're using the nn.Linear() elements we defined above, and the activation function we defined earlier, using the torch.nn.Sigmoid() provided by PyTorch. Now that we've defined the network, we need to define the error function. This is an important bit of information because it defines how we judge the correctness of the neural network, and wrong-ness is used to update the internal parameters during training. There are any error functions that people use, some better for some kinds of problems than others. We'll use the really simple one we developed for the pure Python network, the squared error function. It looks like the following. We've set the size_average parameter to False to avoid the error function dividing by the size of the target and desired vectors. We're almost there. We've just defined the error function, which means we know how far wrong the neural network is during training. We know that PyTorch can calculate the error gradients for each parameter. When we created our simple neural network, we didn't think too much about different ways of improving the parameters based on the error function and error gradients. We simply descended down the gradients a small bit. And that is simple, and powerful. We feed this optimiser the adjustable parameters of our neural network, and we also specify the familiar learning rate as lr. Finally, we can talk about doing the update - that is, updating the neural network parameters in response to the error seen with each training example. 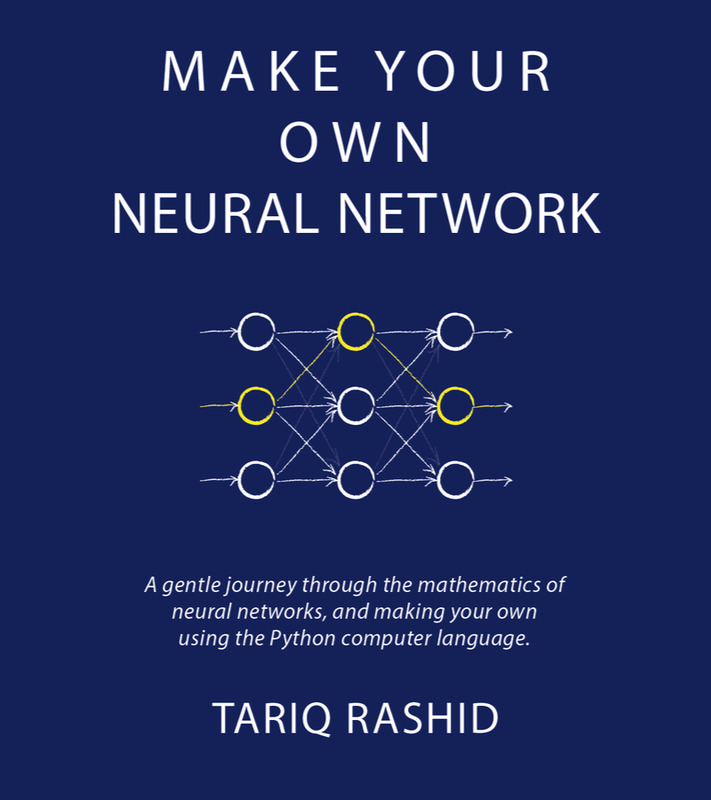 Now that we have all the elements developed and understood, we can rewrite the pure python neural network we developed in the course of Make Your Own Neural Network and throughout this blog. The only unusual thing I had to work out was that during the evaluation of performance, we keep a scorecard list, and append a 1 to it if the network's answer matches the known correct answer from the test data set. This comparison needs the actual number to be extracted from the PyTorch tensor via numpy, as follows. We couldn't just say label == correct_label. The results seem to match our pure python code for performance - no major difference, and we expected that because we've tried to architect the network to be the same. The timing was done with the following python notebook magic command in the cell that contains only the code to train the network. The options ensure only one run of the code, and the -c option ensures unix user time is used to account for other tasks taking CPU time on the same machine. Amazing! Our own home-made code is about 1.9 times faster .. roughy twice as fast! One of the key reasons we chose to invest time learning a framework like PyTorch is that it makes it easy to take advantage of GPU acceleration. So let's try it. The interpretation of these numbers needs some sophistication, especially if our code has multiple threads, so we'll just stick to the simple real wall-clock time of 8m14s or 494 seconds. So CUDA is available. This gave a False on my own home laptop. You can see that this new tensor x is created on the GPU, it is shown as GPU 0, as there can be more. If we perform a calculation on x, it is actually varied out on the same GPU 0, and if the results are assigned to a new variable, they are also stored on the same GPU. This may not seem like much but is incredibly powerful - yet easy to use, as you've just seen. That's it! Not too difficult at all .. actually that took a day to work out because the PyTorch documentation isn't yet that accessible to beginners. That is faster at 366 seconds. That's about 25% faster. We're seeing some encouraging results. The GPU based network is consistently faster by about 25%. Perhaps we expected the code to be much much faster? Well for such a small network, the overheads corrode the benefits. 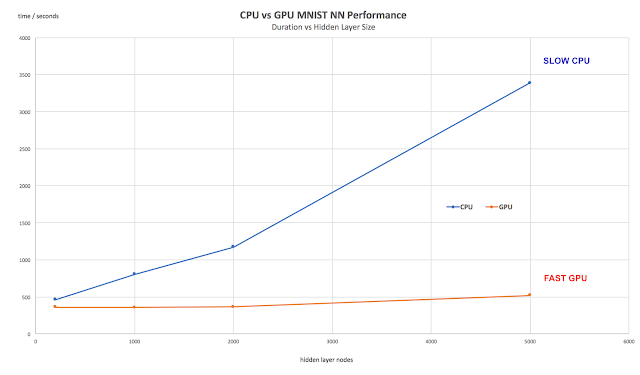 The GPU approach really shines for much larger networks and data. We can see now the benefit of a PyTorch using the GPU. As the scale of the network grows (hidden layer nodes here), the time it takes for the GPU to complete training rises very slowly, compared to the CPU doing it, which rises quickly. One one more tweak .. the contributors at GitHub suggested setting an environment variable to control how many CPU threads the task is managed by. See here. In my Google GPU instance I'll set this to OMP_NUM_THREADS=2. The resulting duration is 361 seconds .. so not much improved. We didn't see an improvement when we tried it on the CPU only code, earlier. I did see that less threads were being used, by using the top utility, but at these scales I didn't see a difference. Hello, I have just finished your book and enjoyed it alot. I liked the parts about input and output manipulation before feeding to the network. Thanks for making life easy! Thanks for your feedback .. I'm really pleased you liked it! If you want to - feel free to add a review on amazon, it helps me invest time in my next book! Hi Tariq, thanks for your lovely and very helpful book. Here you mention that in pytorch SGD is the closest thing to the gradient descent you do in the book. What is the difference? Isn't what you do in the book stochastic? Is it because in the book you don't shuffle? Thanks! hi Aaron - great question. In our own code we take the simplest approach just to illustrate the very basic idea. In PyTorch several methods are available, one of which is SGD. Their approach is more sophisticated than our simple approach - and includes, for example, the idea of "momentum" in the weight change direction. The PyTorch documentation explains their approach, and also points the the papers which they have tried to implement. Another example of a different approach is their ability to use mini-batches (by default iirc) which means they update the weights after a small batch or examples, not after every one . but this is all tuneable. I haven't looked deeply into how PyTorch works but if I did I'd start with some of the documentation which then also points to papers/algorithms they're trying to implement. Thanks Tariq! Was more asking about what happens in the book, rather than in pytorch. Would the books method of GD be considered SGD, since it updates the weights after each training example? Hey Aaron - yes the method in the book can be considered a very simple stochastic gradient descent because it uses data examples to estimate the "true" gradient of the "true" function and improve this accuracy over many examples. @aaron Just to add to this, "Neural Networks and Deep Learning" has a small section on this: http://neuralnetworksanddeeplearning.com/chap1.html CTRL+F "An extreme version of gradient descent is to use a mini-batch size of just 1". @Tariq Thoroughly enjoyed the book, thank you. Especially the beginner friendly approach was -- as a beginner -- very much appreciated. Thanks - I love hearing that the book worked for readers new to the topic. If you really liked it - I'd love an amazon review!